Seldom Seen Acres in Powell, Ohio is an active lifestyle community featuring well-crafted, low-maintenance single-family and attached homes. Homebuyers can live a carefree lifestyle and enjoy clubhouse amenities, scenic views of the community, and participate in social activities with neighbors. Residents will also enjoy the convenience of living in homes built by Romanelli & Hughes and Epcon Communities that feature first-floor master suites. The city of Powell is a great location full of dining, entertainment, and shopping options with easy access to nearby Columbus and Dublin. The social hub of recreation and activities is housed at Seldom Seen Acre's clubhouse. The clubhouse features a wide variety of amenities for residents to choose from that can keep them physically fit or socially entertained. Residents can work out in the exercise room or play cards in the multi-purpose room. Homeowners can also relax with a good book or enjoy a cup of coffee in the sitting area in front of the cozy fireplace. For those seeking outdoor activities, residents can swim in the outdoor pool or lounge around on the deck. There is a barbecue grill available for summer cookouts and gatherings around the pool. 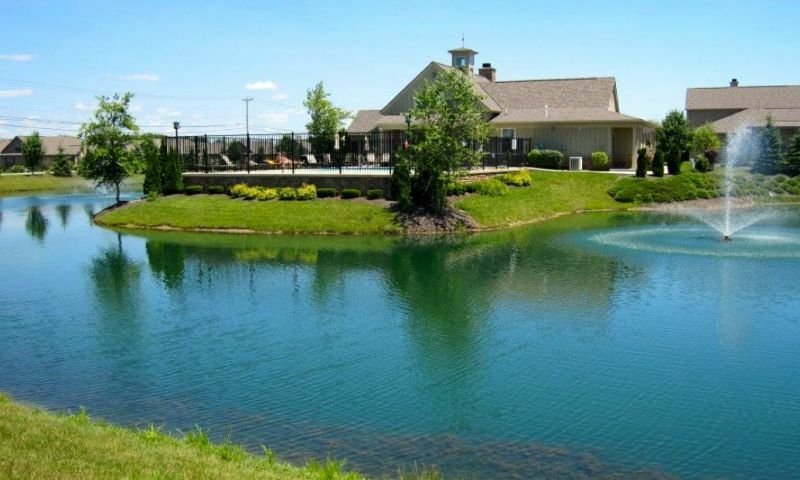 Homeowners can also enjoy the two scenic fountain ponds as well as the beautifully landscaped walking and biking trails within the community. Seldom Seen Acres is a joint development between Epcon Communities and Romanelli & Hughes. Romanelli & Hughes began construction in 2005 and built 82 attached homes at completion in 2012. Epcon Communities came into the development around 2010 during the second phase to build an additional 50 attached and single-family homes and completed them in 2015. Seldom Seen Acres has a total of 132 homes. The attached homes built by Epcon Communities range from 1,137 to 1,806 square feet. These attached homes are part of the Courtyard Series that feature a private patio and courtyard space. These single-story homes have two bedrooms, two bathrooms, and two-and-a-half-car garages. Epcon Communities also features single-family homes from their Courtyard Series that range from 1,519 to 1,995 square feet. These single-family homes have two bedrooms, two bathrooms, and an attached two-and-a-half-car garage. These homes also feature single-story living with high ceilings, spacious master suites, gourmet kitchens, and courtyards. Romanelli & Hughes also built attached homes that range from 2,031 to 2,446 square feet. These attached homes have two bedrooms, two-and-a-half to three bathrooms, and an attached two-car garage. These attached homes feature first-floor master suites, second-floor lofts or basements, fitness rooms that can be turned into additional bedrooms or recreational space. These homes also have elegantly finished trim, granite countertops, and ceramic tile. The Romanelli & Hughes attached homes are available on a resale-only basis. Residents will never get bored at Seldom Seen Acres due to all of the activities, clubs, and committees available for them to participate. Homeowners can join the welcoming committee, bunco club, book club, euchre club, or social committee. Seldom Seen Acres also hosts ice cream socials, potlucks, an annual owners meeting, and holiday parties that keep the homeowners informed and entertained. Whatever the hobby or activity may be, residents are sure to find something to keep their social calendars busy throughout the year. Seldom Seen Acres is located in the city of Powell, which is only a 25-minute drive to Columbus and a 14-minute drive to Dublin. Downtown Powell offers residents plenty of things to do like farmers' markets, street festivals, winery events, and family-style meal nights. There are also plenty of shopping and dining options, such as Liberty Antique Mall, Paris Flea Market, Local Roots, and Powell Village Winery. With so much to do in and around Seldom Seen Acres, homeowners are never too far from recreation or amenities in Powell, Ohio. There are plenty of activities available in Seldom Seen Acres. Here is a sample of some of the clubs, activities and classes offered here. These attached homes are built by Epcon Communities and are part of the Courtyard Series collection. These homes range in size from 1,137 to 1,806 square feet and offer two bedrooms, two bathrooms and two-and-a-half-car garages. These homes feature private courtyards and some homes include a den. These homes are available as new construction and resale. These attached homes were built Romanelli & Hughes and range in size from 2,031 to 2,446 square feet. These spacious floor plans feature second-floor lofts or basements with a fitness room that can be turned into an additional bedroom or a recreational room. These homes feature two bedrooms, two-and-a-half to three bathrooms and two-car garages. These homes are available on a resale-only basis. These single-family homes are built by Epcon Communities and range from 1,519 to 1,995 square feet. These homes feature two bedrooms, two bathrooms, and two-and-a-half-car garages. These models feature private courtyards and some models include a den. These homes are available as new construction and resale. We have friends who decided to move out west for retirement far away from all their friends and family, and now they wish they had stayed closer to home! We originally thought we'd move west too but we're glad we stuck around to enjoy spending more time with our grandkids. We moved here last year and the prices even afford us the ability to travel to warmer states a few times throughout the winter months. Plus our home is so low maintenance we don't have to worry about the yard work or snow shoveling while we are gone. 55places.com is not affiliated with the developer(s) or homeowners association of Seldom Seen Acres. The information you submit is distributed to a 55places.com Partner Agent, who is a licensed real estate agent. The information regarding Seldom Seen Acres has not been verified or approved by the developer or homeowners association. Please verify all information prior to purchasing. 55places.com is not responsible for any errors regarding the information displayed on this website.